Whilst dressing for a fancy ball, Emma finds the invite bears the inscription "Mrs. Peel—We're Needed!" Steed has a spot of trouble getting an antique car started. Emma Has a Close Shave! How are some of the most notorious evildoers of modern times disappearing without a trace—and without leaving British soil? Turns out they found an escape route—through time! And the time machine is a highly profitable contraption created by a stuttering, introverted deviant in order to carry out some dastardly, extroverted deeds. But once the time-traveler makes his escape, what then? While there are some fine period sets and costumes in this episode, it generally lacks spark. The convoluted sequences in and around the barber shop are a bit too contrived and cute, and Emma's motorcycle chase is a prolonged and pointless exercise that feels too much like "padding" to me. Four bowlers, though, for Peter Bowles' remarkable multifaceted performance. 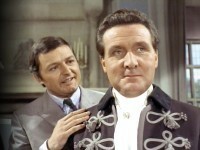 Steed's umbrella contains knock-out gas—a rather "Bondian" touch. And did anyone ever notice that Emma could have easily slipped her feet out of the stocks? Curious: Rocky Taylor played Mitchell, the man doubling for Steed, since Rocky was frequently Macnee's stunt double! Steed's Aunties: Emma is going through some photographs at Steed's flat. He spots one photo and says, "Now, there's a face full of avarice. Reminds me of an auntie of mine." The turkey farm is actually the old farm on Deeves Hall Lane. While Steed and Emma scope out Mackidockie Street, they frequently wind up locked in an amorous embrace to evade detection. Examining Emma's homemade giraffe, Steed remarks, "Known you all this time and never knew that you could sew." Emma: "Well, our relationship hasn't been exactly domestic, has it?" Hmmm!